There is probably no-one as revered in Maher Cup football as Ron Crowe. In 1965 when he was aged just 32 the new Rugby League ground at West Wyalong was named in his honour. When in 1962 he accepted an offer to play for Souths we all became Rabbitoh fans at Toppy school. Ron and brother Les cut wood in the mallee country. My dad, a farmer, bought strainer posts from the Crowe brothers and used to point to them and say, they’re just like ‘Dookie’, a little bit bigger, and stronger and tougher than your regular posts. 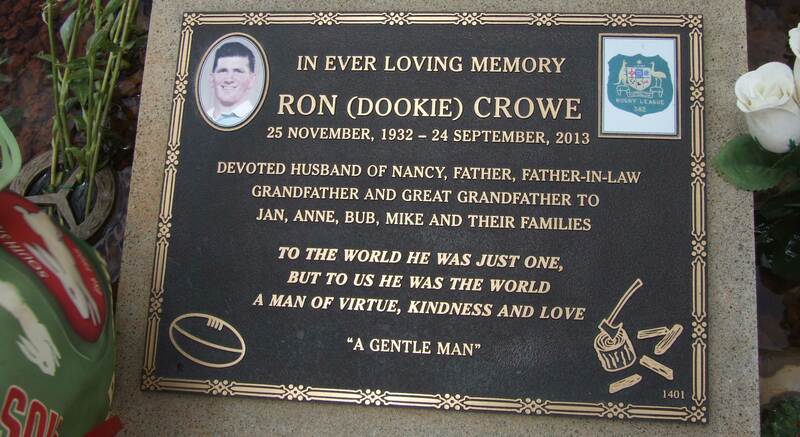 Off the field Ron Crowe was a most gentle man. He played in at least 65 Maher Cup matches and continued to lead packs of forwards way beyond the end of the Cup in 1971 – retiring aged 45 in 1978. 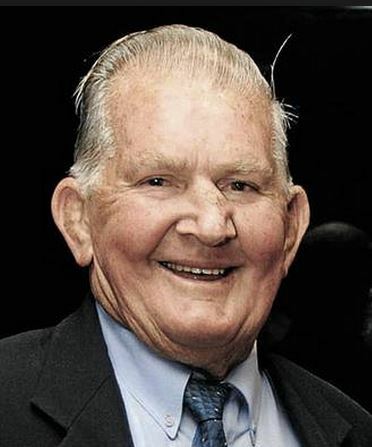 Below is an obituary from the West Wyalong Advocate of 30 September 2014 [with images added] . It is reproduced here with the kind permission of the Advocate. Ron lived his young life moving around with his family, mainly due to his father’s work on road and rail contracts, taking them from site to site living in shanties and attending multiple schools with his siblings Les, Gloria, Keith, Margaret, Nancy and Kay. Needless to say, life was very interesting. Ron started his working life at the age of 14 years under the guidance of Baden Broad at the mine at Fifield. Ron and Nancy were married on April 2, 1952. They had three daughters, Janice, Anne and Denice and son Michael. Ron and Les, settling down with their wives Nancy and Joan, built two homes on Ungarie Road next to Bridie and Bill’s house. The area here became affectionately known as “Crowe’s Nest” as later his sister Margaret married and moved in with her husband Charlie Jamieson next to Les’ house. It was here they developed their own business as carriers, primarily of wood, then at harvest time wheat and hay and later livestock. Ron and Les were known to cart 30,000 bales of hay in 30 consecutive days, an average of 1000 bales a day. When Ron wasn’t working he managed to find time to enjoy an odd game of Rugby league which was one of his greatest loves after his family. Little was it known then that he was destined to become a living legend in Rugby League circles in West Wyalong, the Riverina and throughout the country areas of the State. His first stint of football came with a team known as the Half Moons, when he was 14. The Half Moons consisted of junior players which played mostly social inter-town football in Group 9 and other areas. His ability was quickly recognised and he was to play Maher Cup football for West Wyalong at only 16 years of age. From that moment he became a member of the West Wyalong First Grade and Maher Cup teams. Form he completed when selected in the all time Maher Cup greats team. It was not until 1954 that he burst onto the scene of representative football, when he played for Riverina. 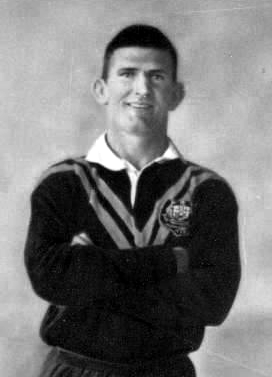 To recap his representation career, Ron played for Country from 1956 to 1968, represented NSW 15 times, represented Australia 10 times (including five tests), toured New Zealand three times (once with the Australian team and twice for Country) and played for combined City in 1962. 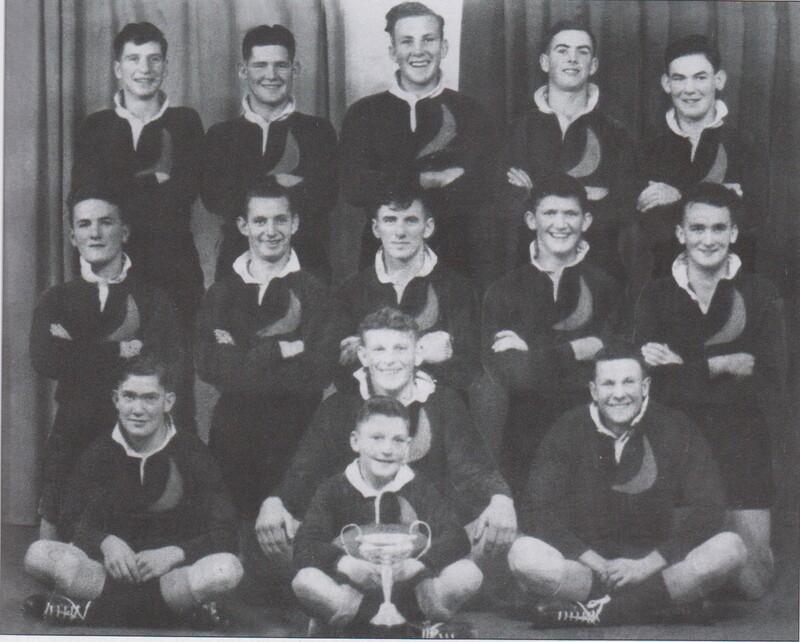 Since 1954 Ron made countless appearances for Group 9, Group 20, Riverina and played for Riverina against England, France and New Zealand, creating many records along the way that will never be broken. 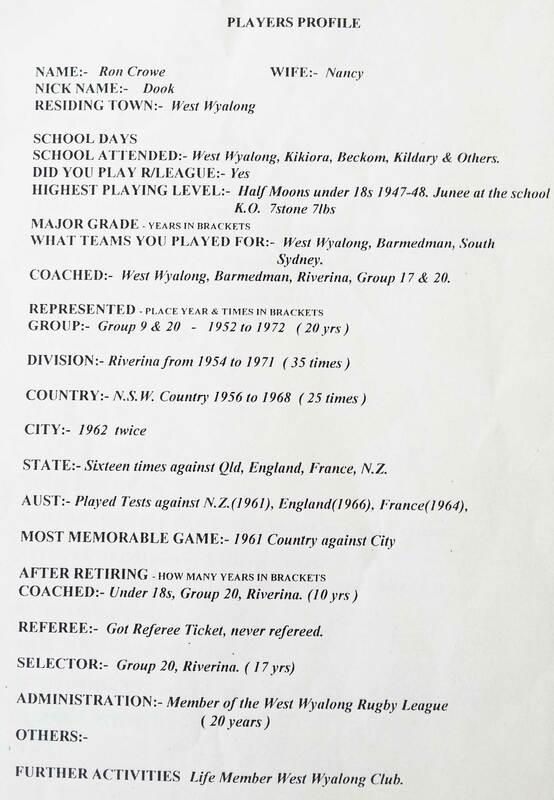 A country boy at heart, he played all his club football with West Wyalong and Barmedman and it was only in 1962 he was lured to Sydney for one season with South Sydney. Even then he lived and worked in West Wyalong and commuted to Sydney for matches each weekend. While playing for Souths his training regime involved running along Ungarie Road to Calleen and home again after an intense labour endured day, carting wood and hay. 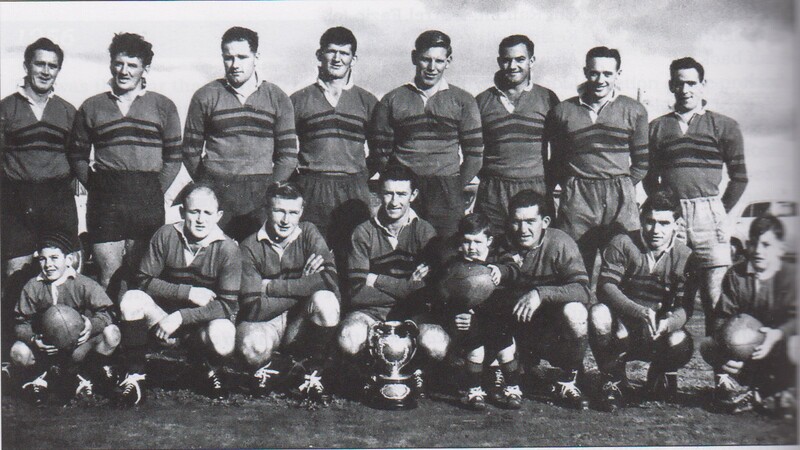 Ron Crowe in the 1956 West Wyalong team which held the Cup for 11 consecutive weeks. With four young children and a wife to support, Ron was committed to his work and family. He made the decision to leave South Sydney but was again lured back by Canterbury with the offer of a farm on the outskirts of Sydney. However this was all in vain as Ron’s heart belonged in the bush and it was a decision he never regretted. He played and coached West Wyalong to many thrilling Maher Cup, competition and premiership victories. Post football, Ron tried his hand at greyhound racing – his favourite dog being Esmine. Esmine was his champion, winning numerous races and holding many a track record. Ron and Nancy enjoyed caravanning around Australia over the years with good friends, the South Coast being a favourite destination. Ron was a down to earth and private person. He would chat to anyone and never changed regardless of who was in his company. He was big in stature and his physical strength was more than the average bloke, but he had a heart of gold. He had a smile for everyone and his personality was infectious – always full of cheek. Ron was known to stitch himself us when he was cut, with his homemade needle and thread. He and his brother Les were frequent visitors to the hospital when their home-made stitches just wouldn’t cut it, as they sustained many injuries through their years of wood cutting. For those who knew Ron it was not uncommon to find him wearing his beloved overalls. He had overalls for all occasions, work overalls, casual overalls and going out overalls. Ron’s life has been dedicated to his family, so much so that when he was asked if he was available for the Kangaroo tour of England by the Australian selectors he declined the offer because of family commitments (a story told often by his good mate John Kelly). Ron coached West Wyalong in 1961, 1964-1968, 1973 and 1978, winning the premiership in 1965, 1966 and 1968. He coaching career at Barmedman spanned four seasons from 1969-1972. In 1970 Barmedman won the Maher Cup and held it for two more games in 1971. In 1965, as a result of his great services to the West Wyalong Club, the town’s new oval was named ‘Ron Crowe Oval’. Ron retired in 1978 at 45 years of age. He always said that even if he had the chance to do it all again he would not change a thing. Family and friends are all so blessed to have had a Ron Crowe in their lives. He was a hero to all and an amazing man who will be talked about for this greatness for years to come. Ron had a huge heart and so much to give. His legacy will live on through all and he will remain forever in their hearts. A special man with an extra special story. This entry was posted in People and tagged Barmedman, Ron Crowe, West Wyalong. Bookmark the permalink.